New Delhi, April 14 (IANS) From singers to actors and comedians, Hindi showbiz has seen an increase in influx of young and talented Punjabi artistes over the past couple of years. Last year, singer Jassie Gill made his acting debut in Bollywood with the film "Happy Phirr Bhag Jayegi". He is now gearing up for the release of another Hindi film titled "Panga", which has Kangana Ranaut in the lead. Directed by Ashwini Iyer Tiwari, "Panga" revolves around female kabaddi players and the trials they face. On his shift from Punjabi to Hindi cinema, Jassie told IANS that he is on "learning mode" right now. "It is my starting stage, so I am learning a lot now. It is a great industry and the best thing is that they welcome fresh talent with open arms. It is great that artistes from Punjab are getting a chance to showcase their talent and I am happy that the industry is open and welcoming the new talent." Punjabi singers and actors Ammy Virk and Harrdy Sandhu are also set to make their acting debut in Bollywood in Ranveer Singh-starrer "'83. The film, presented by Reliance Entertainment, is based on India's iconic win in the 1983 Cricket World Cup. They are currently busy training in Dharamsala for their roles. "You all gave me so much love that I am all set to make my debut in Bollywood. Shukar Waheguru," Ammy had tweeted. Interestingly, both Ammy and Harrdy had marked their singing debut in Bollywood before their acting stint. Ammy lent his voice to the song "Daryaa" in Anurag Kashyap's "Manmarziyaan" in 2018, while Harrdy sang "Nachna aaonda nahin" for movie "Tum Bin 2" in 2016. 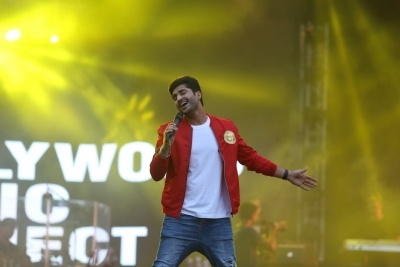 On the singing front, Punjabi singer B Praak recently made his debut in Hindi cinema. He lent vocals to the "Teri Mitti" song for Akshay Kumar's "Kesari". The song even left made Akshay and producer Karan Johar teary-eyed. Year 2019 will also see the entry of popular Punjabi actress Sonam Bajwa in Bollywood. She is a part of Varun Dhawan and Shraddha Kapoor-starrer dance based film "Street Dancer 3D". Talking of Punjabi talent creating waves in Bollywood, one can't forget gems like Diljit Dosanjh, Badshah, Guru Randhawa and Honey Singh, who have succesfully carved their niche in the industry in the recent past. In an earlier interview to IANS, singer-actor Diljit said he is proud to "represent his community" in Hindi showbiz. In 2016, Diljit made his acting debut in Hindi cinema with Abhishek Chaubey's "Udta Punjab", and wooed the audience with his on-screen performance as well as song "Ikk kudi". He bagged a kitty of Hindi film projects like "Phillauri" and "Soorma", and he will now be seen in "Good News" and "Arjun Patiala". Diljit had once said that he had a notion that a "Sardar can't be a succesful actor in Bollywood", but looking at his popularity and credits, it seems he has been proven wrong. On his Bollywood journey, Diljit said: "People told me to get rid of my turban or not become an actor. Back then I knew that I would be okay to give up films, but not my turban. But it has been very rewarding. "The kind of trust such big filmmakers have vested in me to be a part of their projects is really been something that I value a lot." Diljit even became the first turbaned Sikh to get a wax statue at Madame Tussauds, proving that it's 'balle balle' all the way for Punjabis in Bollywood. Now make a complaint about misleading information related to elections through Twitter! अब ट्विटर से करें चुनाव सम्बन्धित भ्रामक जानकारी की शिकायत!